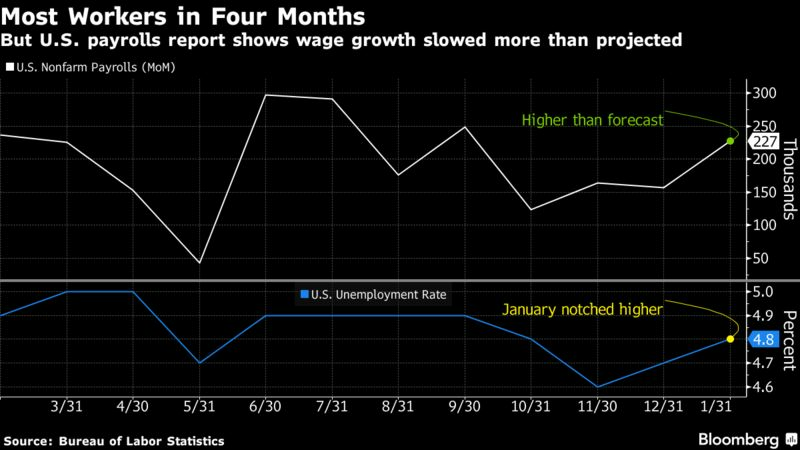 It’s been a big month for the U.S. economy. History was made when the Dow hit 20,000 on January 25th, a mere five days after a new president was installed into the oval office. The streak continues with the first jobs report of 2017, overshooting projections by a massive 47,000 jobs. Median projections called for 180,000 jobs to be added to the economy. Instead, January added 227,000 jobs to the workforce, following a 157,000 rise in December 2016. Wage growth didn’t fare as well, rising only 2.5% instead of the estimated 2.7%. Labor force participation also ticked up to 62.9% from 62.7% and the unemployment rate gained 0.1% from last month. Regardless, the January jobs report set a great precedent for the remainder of 2017. In addition, the fed also held interest rates steady this past Wednesday after raising its benchmark interest rate back in December from 0.50% to 0.75%. Uncertainty over the newly inaugurated President Trump’s economic policies, as well as improving business and consumer sentiments, kept the Fed from moving forward. The next meeting is scheduled to take place in March with the goal of having more clarity on the country’s economic future. People filing for unemployment also dropped in the weekly jobless claims report. Projections indicated an average of 250,000 jobless claims when in reality only 246,000 were filled. That makes the hundredth straight week that jobless claims came in under 300,000, indicating a healthy job market. Becoming a Financial Advisor – is this the career for you?